I recently sat down with Stanford University GSB Professor Jennifer Aaker to discuss her new book, "The Dragonfly Effect". Check it out and enjoy! Over the past year or so, I've become a returning guest on The Small Business Advocate radio show hosted by Jim Blasingame. Who is Jim Blasingame? Just type in "small business expert" into Google to find out! Today - aptly on Cyber Monday - we really tied in the central concepts of "Flip the Funnel" nicely into the retail environment and small business context. Tags: "Black Friday", "Customer Experience", "Customer Service", "Cyber Monday", "Flip the Funnel", "Jim Blasingame", "Joseph Jaffe", "Small Business Advocate", "Small Business"
I've always contended that "viral" videos are the lazy marketer's guide to "new marketing". Simply put: great content will naturally be "viral" and by "viral", I mean shared, passed along and forwarded to others. This week, I am at Stanford University (admittedly the closest I'll ever get to a degree at this prestigious academic institution) and their GSB with a group of clients. I had the privilege of kicking off the week-long program with two keynotes on "The Changing World" and "Flip the Funnel". For the rest of the week, Powered helped facilitate a series of "learning by doing" exercises to give attendees a unique first-hand look at experiencing some of the digital and social technologies, platforms and trends for themselves. One of them included a make-your-own-viral-video or put differently, the ability to create a piece of content which had the most potential to be passed along. In a sense that's what I'm about to do right now i.e. show you the videos (a little bit of influencer outreach meets influencer outreach) and invite you to continue to spread, tweet and post the love to your communities if you are so inclined. ...but there's another angle here as well - to ask you the question: can you predict "virality" and success in this increasingly digital, connected and social world? Watch the videos for yourselves and then answer the questions: which video SHOULD win and which video WILL win? Of course you could choose the same video twice. If you like, explain or justify your reasoning/rationale. Whereas we're judging the videos based on views, content and social seeding strategy...for this exercise, let's just focus on views. Try not to look at views as they currently stand. When community meets commerce in an increasingly digital, connected and social world, great things are possible. This is all about GroupOn - Social Commerce meets Flash Mob meets FourSquare meets Daily Deal meets App. GroupOn had a banner day on August 19th when they brought a recognized brand (GAP) and did $11 million in sales when 445,000 people took advantage of 50% off a $50 deal. So who were the big winners? Gap or GroupOn? Or Both. Bottom line: These platforms are growing exponentially and the numbers are there even if you think they aren't. Don't look at the finger; look at where its pointing. In fact, it's amazing how many marketers have played in this sandbox already - including the likes of Dr Pepper and Travelocity. If you think about it, there's been more mainstream brand activation on Chatroulette compared to Twitter or FourSquare. So even if you're never going to use Chatroulette, use it as inspiration; as a guideline in terms of how you should be thinking about new media, social media, emerging media and innovation. You might even find, its the proverbial minefield that is actually a field of daisies. You want some Flip the Funnel (for free)? For starters, our very own Chief Interruptor (and three time published book author) Joseph Jaffe, will give a keynote presentation from 3-5 pm on Tuesday, November 9 at the Newell Rubbbermaid headquarters. Jaffe will be discussing his latest book: Flip the Funnel: How to Use Existing Customers to Gain New Ones. 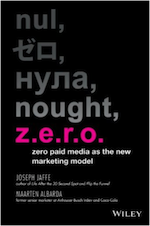 Jaffe will follow the discussion with a Q&A and then book signings. That same night, Tuesday, November 9, Powered will host a Meet Up, from 5-7 pm, at Wildfire in the Perimeter Mall area. Joseph and Iwill be there so we hope you'll join us for some food, networking and maybe an adult beverage or two. Thursday, November 11, my colleague and Powered VP of Strategy, Greg Verdino, will conduct his own Author Event, from 11 am – 12 pm, also at the Newell Rubbermaid headquarters. Greg will discuss his new book, microMARKETING: Get Big Results by Thinking and Acting Small. We will follow the discussion with a Q&A and then Greg will be happy to sign at least a few books. Immediately following Greg's event, the two of us, will moderate a Social Media Innovations panel, hosted by Social Media Atlanta, to feature homegrown innovations. The panel will be from 1:30-4 pm (November 11th) at InterContinental Hotels Group headquarters, and the panel discussion will be followed by break-out sessions allowing attendees to interact with the local technologies. So two things. 1) each event has it's own sign up (I've linked to all of them) so be sure to register as space will be limited and 2) if you're going to be there that week, please ping me on Twitter at @aaronstrout or e-mail me at aaron DOT strout AT powered DOT com. The Median TV viewer age is now over 50. The average viewer of the top 20 programs on TV is out of the coveted 18-49 age demographic i.e. over 50. For Dancing with the Stars as a case in point, the median age is OVER SIXTY YEARS OLD!!!! That's 2 strikes for anyone keeping score. One more strike and you're out. Many and major implications with respect to target marketing, positioning, product mix, messaging, offerings and offers.